Lower wages forced on Spanish workers are a tough sell, but could help shrink sky-high unemployment. The burden of adjustment is likely to fall on the newly employed. Yet tackling the country’s problems requires more reforms than brutal pay cuts. 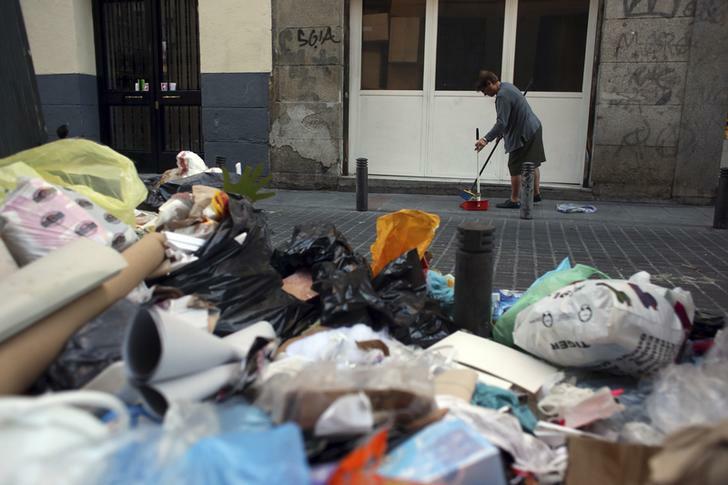 A woman sweeps the floor next to garbage strewn on the pavement on the tenth day of an indefinite strike by street cleaners in Madrid November 14, 2013. Euro zone finance ministers agreed on Nov. 14 to allow Spain to exit an aid programme for its banking sector in January without drawing more European funds. Spain last year took 41 billion euros of a 100 billion euro package of aid to rescue a number of banks that were crippled by bad loans from the collapse of a property and construction bubble and to form a so-called bad bank to dispose of property and loans whose value has plunged. The rescue came as Spain’s borrowing costs soared and the country struggled to avoid following Greece, Portugal and Ireland into a full bailout for government finances.